BLACKSBURG, Va. — Bicycle helmets have been shown to reduce the risk of head injuries in cycling, but, until now, consumers who want to buy one that offers the best protection have had little information to go on. A new ratings program, based on collaborative research by Virginia Tech and the Insurance Institute for Highway Safety, fixes that. The first 30 helmets to be tested — all popular adult-size models — show a range of performance, with four earning the highest rating of 5 stars, two earning 2 stars, and the rest in the 3-4-star range. Cost wasn’t a good predictor of performance. 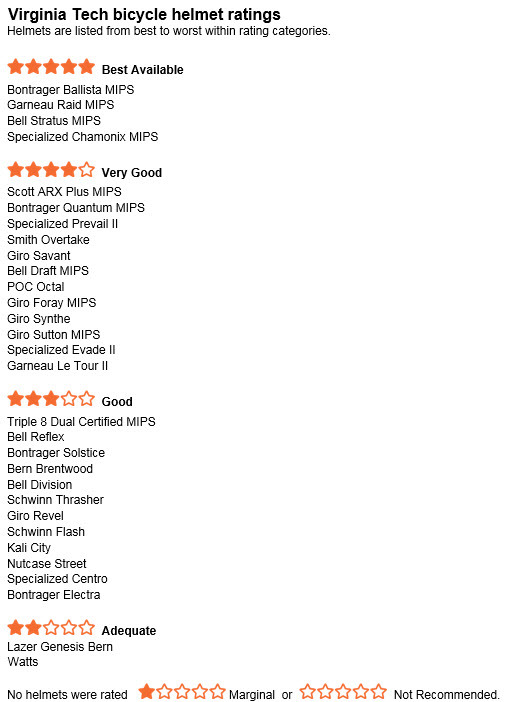 Both the $200 Bontrager Ballista MIPS and the $75 Specialized Chamonix MIPS earn 5 stars. While the government requires that helmets pass a series of tests to be sold in the U.S., the new ratings rely on a more realistic evaluation based on joint Virginia Tech and IIHS research. Bike helmets in the U.S. are required by the Consumer Product Safety Commission (CPSC) to pass a series of tests in which helmets are struck against an anvil at a set speed. The only requirement is that the helmets prevent head impact accelerations over 300 g, a level associated with skull fracture or severe brain injury. There is no requirement for helmets to limit concussion-level forces, which are more common among bicyclists in crashes. Of the four 5-star helmets in the initial test group, all are equipped with a Multi-Directional Impact Protection System (MIPS). This technology creates a low-friction layer inside the helmet. The lab is continuing to test more adult helmets of different styles, including mountain bike and skate/BMX helmets, and will update its website as new ratings are released. Evaluations of youth helmets also are planned. The Virginia Tech Helmet Lab provides independent, evidence-based ratings of protective equipment on a five-star scale, empowering athletes, coaches and parents to choose helmets and other gear that best reduce concussion risk.